Stay Updated - Check your email preferences! SLP Little League uses the email address(s) you provided to NGIN for email communications. For this reason it is important that you enable notifications from SLP Little League via your NGIN account settings. Please take a moment to ensure your account is setup properly to receive notifications. On the top of the page you will see your user name, click that to go to your account dashboard. Once on your account dashboard, on the left hand navigation select "Account Settings". 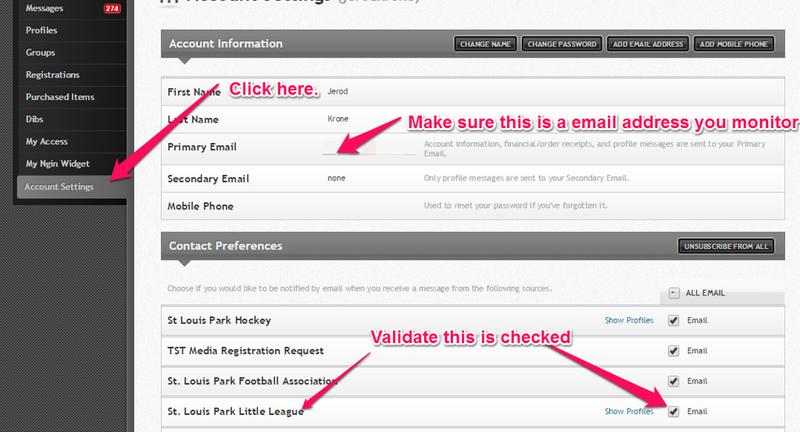 Under "Contact Preferences" ensure that "email" is checked for St. Louis Park Little League.  I will remember that the game is for the players and not for the adults.  I will be positive and supportive of each child’s efforts, recognizing that each child is an individual and each possesses different skills and abilities.  I will remember that the development of baseball skills through practice and perseverance is more important than winning games.  I will encourage good sportsmanship by demonstrating positive support and behavior toward all players, coaches, officials and other parents/spectators at every game or practice.  I will come to the events drug and alcohol free and maintain that environment throughout the event.  I will treat coaches, umpires and league officials with courtesy and respect before, during and after games.  I will not undermine or question the coach’s instructions, directions or decisions.  I will place the realistic skill development of my child above my own personal expectations.  I will stay out of the dugout before, during or after games and practices. If I would like to speak to a coach, I will respect the 24 hour rule and contact him or her after 24 hours has passed. If the matter is one of safety or integrity, I will speak directly to a board member.  I agree that I will support the emotional and physical well-being of all the participants on my child’s team, ahead of any personal desire to win games or any desire for personal glory.  I will follow our organization’s policy on social media. Failure to comply: Any suspected violation of the above Code of Conduct should be reported to the St. Louis Park Little League Board. Violations may result in game suspension or banishment from the St. Louis Park Little League. This policy shall apply to all coaches, players, parents, guardians or other persons associated with St. Louis Park Little League (SLPLL) regarding use of social media. This policy applies to the above participants on and off of the field. The goal of SLPLL is to ensure that its participants – coaches, players, parents, guardians, fans, etc. – maintain the highest standard of sportsmanship and ethical behavior at all times. Adherence to this policy shall be a condition for continued participation in the SLPLL program. A parent/guardian is required to acknowledge this policy in writing and inform the participating player of the policy. This policy will be included in the SLPLL Codes of Conduct for Players, Parents and Coaches, respectively, and must be acknowledged in writing and collected by the SLPLL Board President before the team’s first practice. We take seriously and will address all inappropriate use of social media. "Social Media" is defined to include: Web sites, Web logs (blogs), wikis, social networks (e.g., Twitter, Facebook, MySpace, LinkedIn, Flickr, YouTube, etc. ), online forums, virtual worlds, text messages, email and any other social media generally available to the public or consumers. "Inappropriate Communication" is defined to include: any statement, comment, assertion, posting, communication or message of any type that serves to harass, threaten, bully, denigrate, defame, disparage, belittle or impugn the character of the SLPLL or any players, parents, guardians, coaches, umpires, volunteers or board members associated with SLPLL. Use of any social media network and postings, displays or communications on any social media network must comply with all state and federal laws, any SLPLL policies and the SLPLL Codes of Conduct for Players, Parents and Coaches. Participants must be respectful and professional in all communications (by word, image or other means) via Social Media. In keeping with this basic expectation of respect and professionalism, participants in SLPLL must refrain at all times from (i) engaging in any Inappropriate Communication via Social Media; (ii) using obscene, profane or vulgar language via Social Media; or (iii) promoting unlawful activity, including unlawful acts relating to alcohol, controlled substances or sexual misconduct. Participants may not act as a spokesperson for SLPLL except as authorized by the SLPLL Board. When authorized as a spokesperson for SLPLL, participants must disclose their relationship with SLPLL. Participants may not disclose information on any social media network that is confidential or proprietary to SLPLL, its players, parents, coaches, umpires, etc., or that is protected by data privacy laws. Participants will be held responsible for the disclosure, whether purposeful or inadvertent, of confidential or private information, information that violates the privacy rights or other rights of a third party, or the content of anything posted on any social media network or internet site as it relates to SLPLL. Anything related to SLPLL posted on a participant's Web site or Web log or other internet content for which the participant is responsible will be subject to all SLPLL policies, rules, regulations or guidelines as amended from time to time. A SLPLL participant who is responsible for a social media network posting that fails to comply with the rules set forth in this policy may be subject to discipline as outlined in the SLPLL Code of Conduct for Players, Parents and Coaches. These are the guidelines for social media in SLPLL. If you are a participant contributing to blogs, wikis, social networks, virtual worlds or any other kind of social media, these guidelines are for you. We expect all who participate in social media to understand and follow these guidelines. Failure to do so could put you at risk. These guidelines will continually evolve as new technologies and social networking tools emerge, so please check back once in a while to make sure you are up to date. It’s your responsibility. What you write is ultimately your responsibility. If it seems inappropriate, use caution. What you publish is widely accessible, and it will be around for a long time, so consider the content carefully. Trademark, copyright and fair use requirements must be respected. Ensure the safety of the players. When participants choose to join or engage in the social networking groups, they do so as an ambassador of SLPLL and have the responsibility for monitoring content and addressing inappropriate behavior or activity on these networks. This includes acting to protect the safety of minors online. Be transparent. Your honesty—or dishonesty—will be quickly noticed in the social media environment. If you are posting about your involvement, use your real name and identify your relationship with SLPLL Be clear about your role; if you have a vested interest in something you are discussing, be the first to point it out. Protect confidential information. Be thoughtful about what you publish. You must make sure you do not disclose or use confidential information. Players, parents, coaches and other participants should not be cited or obviously referenced without their approval. For example, ask permission before posting someone’s picture in a social network or publishing a conversation that was meant to be private. Respect your audience and other participants. Always express ideas and opinions in a respectful manner. Make sure your communications are in good taste. Do not denigrate or insult others. Remember that our communities reflect a diverse set of customs, values and points of view. Keep your cool. One of the aims of social media is to create dialogue and people will not always agree on an issue. When confronted with a difference of opinion, stay cool. Sometimes, it’s best to ignore a comment and not give it credibility by acknowledging it with a response. Be careful with personal information. Make full use of privacy settings. Know how to disable anonymous postings and use moderating tools on your social media sites. Board meetings are open to all members. If you have an issue, please contact a board member, and we will add you to the agenda to discuss. As an organization, we value being transparent and welcoming. If your experience is a matter of integrity or safety, please alert a board member as soon as possible so that the board may address the matter in a timely manner. ©2019 St. Louis Park Little League / SportsEngine. All Rights Reserved.